Keyless Entry Remotes are standard on most MAZDA MX-5 MIATA. MX-5 Miata Remote controls are a great feature allowing hands-free locking & unlocking your car doors. 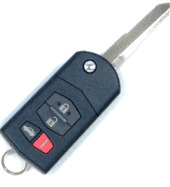 Free do it yourself remote programming instructions come with MX 5 Miata Mazda key fobs, transmitters. 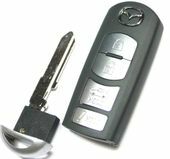 Late model Mazda's come with a switchblade transponder key and remote transmitters key fob combined.